A business succeeds when its employees perform their best and are more productive and efficient in their roles. Many times, the key to improving employee performance is to educate them on their jobs or by teaching them skills. Continued training can provide many benefits to a company as well as for the employee. One of the reasons to provide training opportunities for your staff is to help them learn skills they can use to promote as job openings occur. They can promote up within a department or move across departments as they develop skills which can be used in other areas. It’s costly to hire and train a new employee, but you can save money by promoting someone who is already familiar with the organization and understands the culture. However, you must invest in your employees in their current positions if you want them to continue to show their loyalty to the company when they look for higher-level jobs. It’s not uncommon for employees to know their jobs well enough to get the tasks done, but not well enough to be efficient. They may learn certain aspects of their position while not being as adept as they could be with further training. When you provide courses for employees that help them learn new skills they can apply to their current jobs, you increase their abilities and satisfaction with the job. For instance, they may be able to use Microsoft Office, but they may not know all the tips and tricks which can help them reduce the time it takes to do the job. A course designed to teach a more in-depth course on Office would enhance their ability in the position. 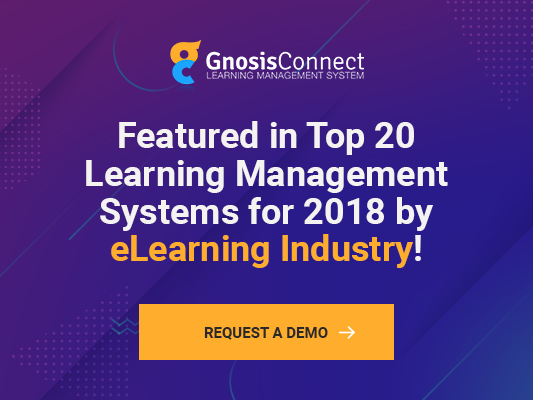 GnosisConnect provides many features as a learning management system which helps you coach your employees to improved performance as they develop their skills. Add in extra information to enhance the courses you include for your employees. You can also monitor employee progress as they read through the material and take tests. You can create reports which show important metrics for how your employees do on their courses. You can build tests that determine understanding of the material so you know if staff are learning what they need to know to do their jobs. One of the features about this LMS is the ability to provide feedback so your employees know how well they are doing. You can also create references and provide hints and tips that will help them improve their ability to learn the material. If the goal of your business is to build up employees and help them learn the skills they need to succeed so your company can thrive, you need to provide continuing education and training that will help them reach their goals. A learning management system can help you keep track of the education provided to your staff and enable you to provide coaching to make the most of the learning materials being utilized. Joyce is a full-time writer who enjoys creating content to help businesses succeed. She's also a single mother and foster parent who loves to travel and spend time outdoors.